Cozumel is a picturesque Caribbean island in Mexico that just about 100,000 people call home. The island’s blue waters serve as a popular port for cruise ships and scuba diving. Famous attractions include the Arrecifes de Cozumel National Park where Museo Subacuático de Arte’s submerged sculptures are hidden and the Chankanaab eco-park is home to dolphins and other wildlife. Cheap flights to Cozumel are now available for a limited period of time, so get ready to be blown away by this island’s captivating beauty. Cozumel is home to the Cozumel International Airport (CZM) which is just a 30-minute drive from the city centre. CZM mainly serves the major independent American airline, Delta Air Lines. Affordable flights to Cozumel depart from Cape Town and Johannesburg. The flight duration from Johannesburg to Cozumel is approximately 23 hours and 42 minutes. Scuba dive and snorkel in the gorgeous waters of Arrecifes de Cozumel National Park, with its beautiful coral reefs and rare and protected species of sea turtles and other wildlife. Cozumel is known for its blue waters and welcoming beaches, like Paradise Beach, where you can relax, sunbathe or sip a cocktail in the warm Caribbean sun. 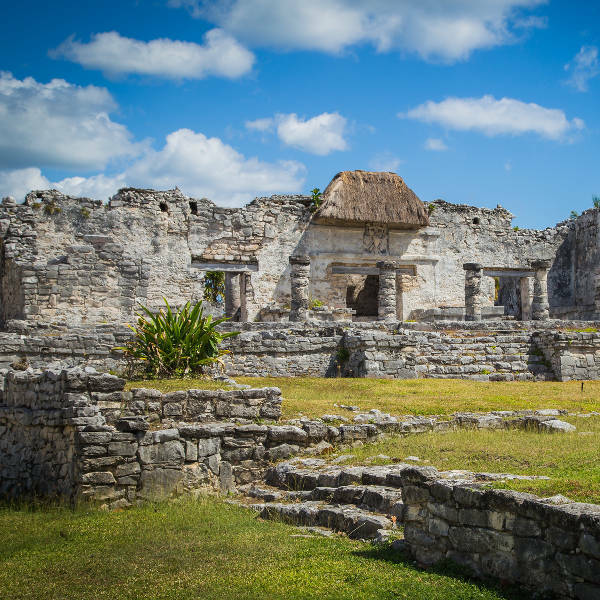 Delve into the mysterious and intriguing Mayan history and culture by exploring the captivating and magical remains of the 800-year-old Tulum city overlooking the vast Caribbean Ocean. Cozumel enjoys a tropical savanna climate and the summer period between December and March is the peak tourist season on this gorgeous Caribbean island. The welcoming blue waters, sunshine and annual colourful Carnaval Week in February draw thousands of revellers to Cozumel every year. If you prefer to visit when accommodation and air fares will be cheaper, visit Cozumel between the months of July and November. Summer temperatures are highest in July and August but it is bearable and the best time to go diving as underwater visibility is beautiful and crystal clear. From September until November the island experiences its rainy months so if you go during this period you should keep an eye out for hurricane warnings. Other than that, temperatures are still warm and perfect for sightseeing or celebrating with the locals on Mexican Independence Day (In September) or the exciting Mexican Revolution Day (In November). Cozumel is a picturesque Caribbean island in Mexico and sought after tourist destination with a unique history and authentic culture. The island’s blue waters attract a multitude of cruise ships and avid scuba divers in its peak summer season. 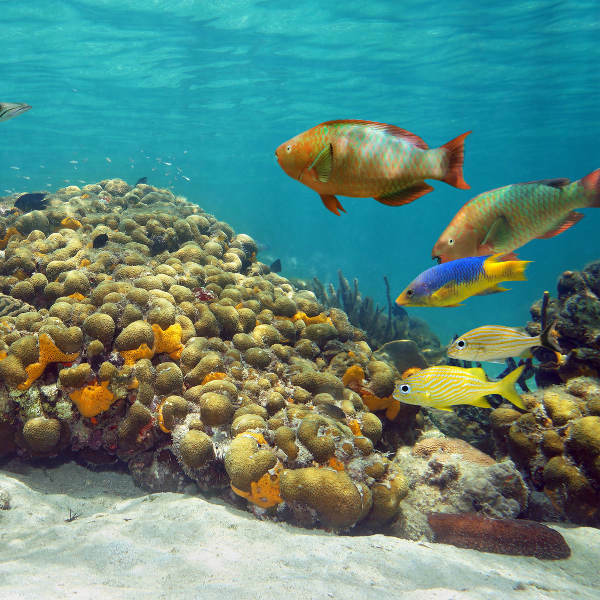 Go scuba diving and snorkelling in the gorgeous waters of the Arrecifes de Cozumel National Park. It is the second largest coral reef system in the world and home to protected species of sea turtles and the sea snail, the Queen Conch. A few kilometres from there you will find the famous Cancun Underwater Museum where intriguing, submerged sculptures are hidden. Be blown away by this island’s captivating beauty and magical history on a tour of the remains of the 800-year-old Tulum city. What was a fortress against enemies perched on a lookout over the vast Caribbean Ocean, is now the best-preserved and second-most visited ancient Mayan ruins site in Mexico. After some serious diving and sightseeing, make time to relax or sunbathe on one of Cozumel’s gorgeous beaches, like Paradise Beach. Cozumel’s main square also hosts a multitude of restaurants that serve fresh seafood, traditional cuisine like delicious fajitas and strong, but yummy, margaritas. Compare several airlines, and book your cheap flights to Cozumel online at Travelstart! South Africans do require a holiday visa to enter Mexico and need to appear at the Mexican Embassy in person to apply. Requirements for the visa include proof of address, proof of employment and routine vaccination records. Ensure your South African passport is valid for at least six months beyond date of departure and has at least two blank pages available for stamps. The Mexico High Commission can be found at 570 Fehrsen Street, Parkdev Building, Brooklyn Bridge, in Pretoria. The Embassy is closed on Mexican Public Holidays. Before travelling to Cozumel, Mexico, make sure your routine vaccines that include the MMR vaccine, DPT, Chickenpox, Polio and yearly flu shots are updated. Although it is not an entry requirement, most travellers are advised to be vaccinated for Hepatitis A and B, Typhoid and Malaria. While in Cozumel, it is best to drink pure, bottled water and, if you purchase any produce from street vendors, wash or peel the product before eating it. Cozumel is a safe island, however, you should still practice normal safety precautions. Keep your valuables and important documentation safe and watch out for petty crimes like bag-snatching or pick-pocketing. Always travel in groups, avoid beaches after dark and do not swim in waters with black or red flags posted as this signifies that the water current is dangerous. Avoid unsavoury nightclubs and only use licensed and reputable cab companies.